I attended a conference this weekend, & having ADD, it helps me to stay focused by keeping my hands working on simple tasks, so I brought the Dragonflies, & did some simple trim work, while listening to lectures all day. The photo below is a single flat plaid ribbon, that I folded into points, & stitched down. I inked in some of my quilting with just fiber pens. Today I added another piece to the upper right corner. It just needed it. I also colored 3 pieces of lacey things from my stash to be later included. I've gathered & packed floss & beads, & will pack it all along when we travel in a few weeks. This is it for now, on this piece. 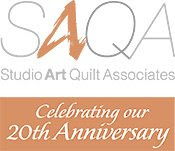 Next week is our quilt show, so if yo happen to be in the area, come join us at the Phillips-Conoco Atrium, downtown on 7th & G Saturday & Sunday, Sept. 17 & 18. Beautiful collection of ideas going into this quilt already! Love to see you work! I love the blog, it's nice to see and hear the details and there's a lot beautiful details in the piece! Wish I was there for the show, do you have any quilts in it? I wish you were here too Kathy. Yes I'm hanging 1 large quilt of my own, plus carol's quilt, &3 small ones. Hi Deb, this is really lovely. I love the central motive design. Hope all is good with you. I must read more of your blog and catch up!